Georgia’s first city – that’s where you call home. Sitting along the Atlantic coastline, Savannah, Georgia has been serving up Southern hospitality to citizens and tourists for generations. But what makes Savannah so delightfully charming? Is it the historic district? Quaint shops? Beautiful, natural riverfront? It’s probably a little bit of everything! Young, old – it doesn’t seem to matter because everyone falls in love with Savannah. And they have been doing so since the city began to thrive three centuries ago. In fact, it’s so easy to enjoy the city on foot thanks to its pedestrian-friendly layout. Walkers love to tour the riverfront where the city’s history comes to life thanks to the restored cotton warehouses. Another reminder of the past can be viewed right along the city’s streets where preserved antebellum mansions are showcased. Though the city’s history still lives on, it is sure to delight the young at heart, too! The downtown district features a bustling nightlife, world-class dining and shopping. Whether you’ve come to tour the educational museums or take a boat ride along the river, Savannah has something for everyone. Of all that Savannah has offered you, your friends and family, isn’t it time you gave something back? It’s unrealistic to think that Savannah will keep staying beautiful on its own – the city needs your help. 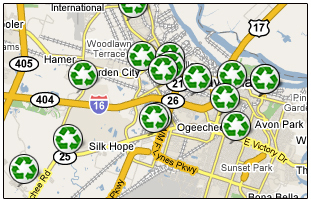 Whether you’re a resident, business owner or tourist of Savannah, here’s how you can help the city you love stay beautiful: think green. Remember the three R’s: reduce, reuse, recycle. By doing this you’ll actually save tax dollars, save on energy and help reduce garbage in landfills. You can also conserve on energy – start by turning the lights off every time you leave a room. Most important, reduce your vehicle emissions. Since Savannah is such a pedestrian-friendly place, get out and walk and take in some fresh air instead of driving everyday. When your friends, family and children see you making small changes, they’ll do it, too! Lead by example, donate your time to local green efforts and spread the world about global warming. It’s time to ensure that Savannah’s beauty lives on for our children and grandchildren. Additional information is in development.